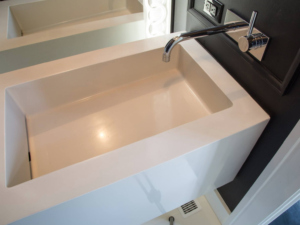 Using Specialty Finishes to Create Your Dream Bathroom - Steve's U-Cart Concrete, Inc.
f you are seriously thinking about upgrading an existing bathroom or in the process of building a new home, you have a lot of decisions to make. Although you can go with more standard design elements, why not go all out and create the bathroom of your dreams? Using specialty finishes, virtually anything is possible. The most obvious change using specialty finishes is the floor. However, you have far more opportunities, including a one-of-a-kind countertop, sink, bathtub, and shower. With an array of colors, textures, patterns, and techniques, you will have no problem finding the exact finish for your preferred aesthetic. As an example, you can choose to have a sink designed using specialty finishes, resulting in a true masterpiece. Regardless of whether you are interested in something that is Asian-inspired, like a red and black sink, something more streamlined for a transitional look, a double vanity that fits in perfectly with a contemporary bathroom, or a sink with rugged edges and warm colors for a country feel, specialty finishes will achieve the goal. For something completely over-the-top, yet beautiful and fully functional, consider a free-standing textured concrete bathtub, complete with copper or brushed nickel hardware. With no limitations as to what a professional can accomplish, spend ample time researching ideas. By working with a reputable company, your own ideas can easily be incorporated into the overall design scheme. You can beautifully transform walls and other surfaces – even a fireplace in your bathroom – using specialty finishes. You can keep the bathroom aesthetic cohesive or choose to mix and match finishes for a more unique design. For all home styles, specialty finishes are an exciting way to create the bathroom of your dreams. You can go even further by having other elements in the home changed, including the kitchen countertops, stairways, and of course, various design elements outdoors. Finally, use the handy Concrete Calculator at Steve’s U-Cart Concrete here http://u-cart.ca/concrete-calculator/ to calculate how much you’ll require for your DIY project.